Steve Tyree has done an excellent job of extending the ways in which currently available audio-visual media can enhance the education of the modern aquarist. As a media columnist for aquarist’s publications I have reviewed books, articles and videotapes – but this is the first time I have reviewed a compact disk full of information. 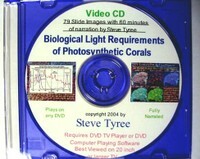 Steve talks fast to get all of his information across in 60 minutes and for some of the slides he essentially reads the text presented on the screen, but all in all the CD is successful at transmitting loads of information as well as provocative hypotheses about the light requirements of corals and their observed pigmentation under differing light regimes. Much of this material was presented at the recent MACNA XVI conference in Boston, but due to the crowded presentation schedule, many of us, including myself, missed this information. The main section of this presentation however is centered on the topic of colorful coral pigmentation. Tyree discusses the three main types of coral pigments and recent scientific research about these pigments. In what was to me the most exciting section of his presentation, he outlines a technique he refers to as “Light Bracketing” which can be used by aquarists to learn what type of pigments they have in their specific corals. He includes discussion of the effects of “Black Light” and UV radiation on observed coloration and fluorescence. He also presents information on specific spectra, especially blue and green light effects. I’m off to pick up a Black Light tomorrow to play with, and I may get a green mini-spotlight too. If you watch his material you may be tempted to experiment also. Tyree concludes his presentation with what he believes is an example of what he calls “pigment grafting” based on an aquarium reef observation in which it seemed that the pigments of one coral were “grafted” onto an adjacent colony from a different family which it touched. If this can be replicated it is an interesting discovery indeed with implications for “tailored” coral colors. The CD is available in two formats. Tyree’s advice on playback is as follows: The Video CD format will run on any DVD player like any DVD movie. It is best viewed on a 20-inch or larger TV. The Video CD can also be viewed on a computer with a DVD and DVD player software. This resolution is recommended that for those who do not have a Windows PC or who want the comfort of viewing this presentation on a DVD and TV set. The presentation is also available in PC CDROM executable format, which will auto run the presentation on a PC with Windows XP, Windows ME, Windows 2000 or Windows 1998. Minimum system requirements are a CDROM drive, at least 64 Megs of RAM and a 600 MHz processor. He recommends the PC CDROM format for Windows PC’s because this format is displayed in a high resolution format (1024 x 768) that shows greater detail. My copy is apparently in the Video CD format. I was surprised that slides were clearer on my TV set than on my 17″ LCD monitor, but the clarity was not optimal in either case. The PC CDROM version may be superior in that way. This 8 1/2″ x11″ volume contains 114 pages that are illustrated with many color photographs and informative line drawings. An appendix containing a list of resources, a bibliography and an index is included. Although this book has been in my library for a few years, I have not reviewed it for Advanced Aquarist because it is clearly written for novices. Two recent requests for advice on setting up new tanks, an experience I’m sure many of you have also had, reminded me of how useful Mike Paletta’s well illustrated handbook for planning and setting up a marine aquarium is. His advice on starting “fish only” marine aquariums was especially helpful for me here in Hawaii, where strict regulations on collecting or importing corals are in effect. Thus, while this book is not directed at advanced aquarists per se, it is a very worthwhile item to have on your list of recommendations for newcomers to the field and a good source of information on the basics you may have come to take for granted. Mike, well known to marine aquarists, emphasizes a simplified approach. He starts with “Getting Started” by emphasizing good pIanning and includes a detailed checklist and advice on aquarium budgeting. He has clear and concise descriptions of appropriate equipment for filtration, lighting and water movement with pros and cons for each type along with sensible discussions of differences in cost. His material on lighting however stops with standard output fluorescent bulbs and does not include higher intensity – and more expensive – lighting. The second chapter, “Saltwater Primer,” presents the basics of the nitrogen cycle and nutrient cycling as well as water chemistry including pH, alkalinity and salinity. Chapter 3 covers the use of live-rock biofiltration and has a very worthwhile discussion of aquascaping basics. 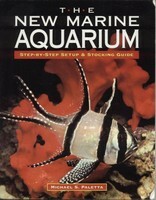 Chapter 4, “Establishing A New Aquarium,” is organized with the “Step-By-Step” system mentioned in the book’s title. He offers another detailed checklist and a list of common mistakes to be avoided. This is a thorough presentation that if followed could save new aquarists considerable grief. He concludes the chapter with a section on what he calls “The Barebones Desktop Tank, or Young Aquarist’s Starter System” for a 15-20 gallon tank with fishes, ornamental shrimp and fan worms in addition to the snail and hermit crab clean up crew, again with a detailed checklist. The next section is a fish-selection guide. He suggests 5 basic stocking strategies: a 40 gallon “Peaceful Community” tank, two versions of a “Mixed Community” tank – one for 50 gallons, the other for 75 gallons, a 90 gallon “Caribbean Community” tank and a 120 gallon “Predator/Aggressive” tank. Any of these would make fine fish-only displays, especially with the addition of “hardy invertebrates.” Corals are omitted from these setups because of the use of low cost – low intensity lighting. The book concludes with a chapter on feeding and maintenance schedules and a final chapter on diseases and treatment.